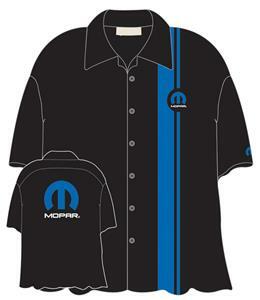 The Mopar M Logo Crew Shirt features a large "Omega M" Mopar logo embroidered on the back of the shirt, with a small logo on top of a blue stripe on the left front. There is also an M on the left sleeve. This is all on a black collared short sleeve crew shirt. This high quality shirt is made from easy care 65% polyester/35% cotton and is machine washable.